How does fun casino hire work? 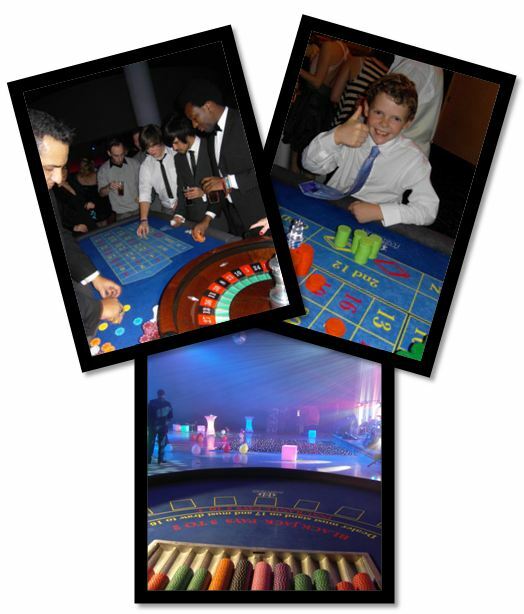 Harlequin fun casino hire offers a polished and professional service from start to finish. Start by calling us or filling out our online enquiry form, and tell us a little bit about the event you are organising. We’ll be able to advise you on the right amount of casino tables to have at your event, and give you a quote for your event. If you’re happy to go ahead, we’ll put your date in the diary and then you can relax. We’ll contact you about a week before the event to confirm the date, time and any other requirements. On the day, we’ll arrive at the venue long before the fun casino is due to begin, and set up the fun casino tables ourselves. Arrangements can be made to set up the tables a day in advance if necessary. We’ll run the fun casino for as long as you need us, and then, we’ll take down the tables quickly an discreetly, and leave you to enjoy the rest of your event. All our costs are fully inclusive of VAT, insurance, croupier fees and travel costs.The cost of hiring a fun casino depends entirely on the number of guests you have attending your event, the number of tables you require, the length of time you would like to have in play and whether or not you would like us to theme thenight. For a fully detailed, no obligation quote, please call our friendly staff or fill in the enquiry form and tell us a little bit about the type and size of the event you are organising. We’ll get back to you as soon as possible with a full breakdown of costs. Our prices are not a secret, it’s just very hard to quote without knowing more about your event. If you are shopping around and are unsure of how much you should be paying for a fun casino, it’s important for you to know that no-one should really be quoting over £290 for a single table, and the price per table should decrease with the more tables you hire. There are obviously exceptions to this rule, but it’s a decent benchmark to go by if you’re looking for a ballpark figure. Do we have to know the rules already? No! Even if you have never played casino games before, our experienced and friendly croupiers will be able to explain the games to anyone who has never played before, and will continue to give pointers and helpful tips throughout the night. It’s a great way to learn how to play casino games without the fear of losing any money! How many fun casino tables should I hire? This is very much up to you, however, we normally recommend one fun casino table for up to 50 guests, and more tables as the number of guests increases. Two or more tables gives you the advantage to have two different games available, giving your guests variety and choice. Your package can be made up of either roulette tables, black jack tables or poker tables. You tell us what you want, and we’ll be able to advise you on the number of casino tables you might need, but when all is said and done, the decision is completely yours. What will I have to supply for my fun casino night? 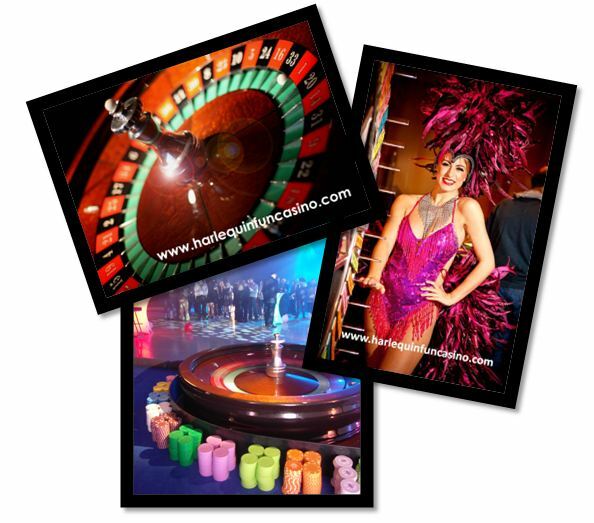 Harlequin fun casino hire is a complete service. As long as you provide the venue and the guests, we provide everything else. We can even provide a prize for the winner on request. We can also provide props, lights and other entertainers such as magicians, singers, bands, DJ’s and all kind of party entertainment. Let us know what you’re planning and we’ll see if we can help. Can I have a fun casino at my wedding? Of course! Wedding fun casino hire is very popular. It’s a fabulous and unique way to celebrate your special day, and has proved very popular for couples who get married abroad, especially in Las Vegas, who have organised a reception back in the UK to celebrate with family and friends. It’s a great way to bring the all the fun of Las Vegas to their guests back at home! How long does the fun casino night last? 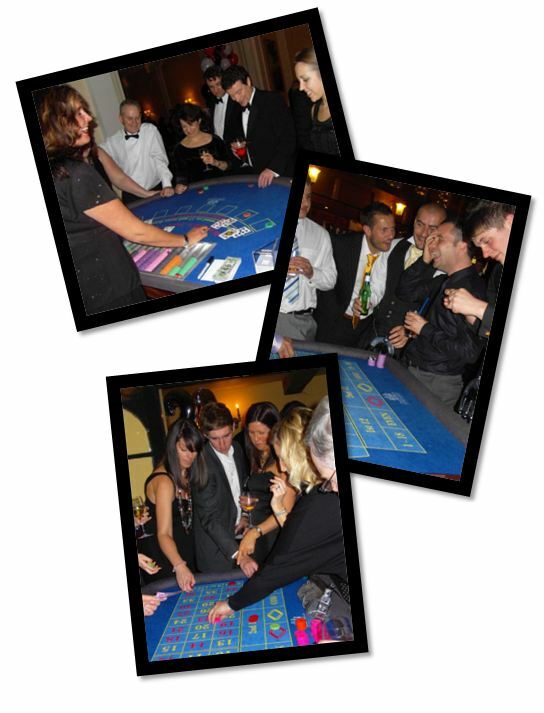 Our croupiers will deal for 3 hours continuously at your event. This does not include the set up time beforehand or the take down time at the end of the night. If, after 3 hours of play, your guests are still engrossed in game, we’ll happily stay as long as you want us there, but a very long event may necessitate an extension of the fee to compensate our hostess, croupiers and drivers. Do you need a gaming licence to have a fun casino? No. Harlequin fun casino hire is fully compliant with the Gaming Act of 2005. and the Lotteries & Amusements Act of 1976 . Since we do not play with real money, there is no need for you to acquire a gaming licence.